Strike a balance between feel and performance with Srixon® TriSpeed Tour Golf Balls. 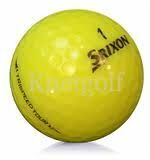 Designed for golfers with swing speeds under 100 mph, golf ball features a Rabalon™ infused mid-layer and mid-compression Energetic Gradient Growth™ core to maximize spin control around the green. A thin, soft ionomer cover formulation elevates both feel and durability. Get up and down with ease while playing Srixon® TriSpeed Tour Golf Balls.